Saturday, 9/24: We surprised ourselves by being awake and ready to go by 8:45, a scant four hours after collapsing into bed after our aurora hunting adventure. With plenty more to see and do in Fairbanks, however, we were glad to get the day started. Let's get this boxing started. There are more than 350 trails and multi-use paths in the Fairbanks area, and the ones sheltering letterboxes were calling to us. Picking up where we left off with letterboxing yesterday, we drove north of town on Steese Highway to a trail adjacent to the Alyeska Pipeline. Behind a tree near the trail we found an unusual letterbox containing six stamps related to places in Oregon. Next stop was the Karl Reishus Trail, one of many on the UAF (University of Alaska Fairbanks) campus. Recent rain had rendered the trail a soggy bog but we slogged on, thankful for waterproof boots. When it finally dawned on us that the Y-tree (trunk split well above ground level) we had walked past six times in our search was actually the V-tree referenced in the clue, we were soon stamping in at the letterbox. On our return to the car, we were surprised to see an athletic UAF student and her blue-eyed Siberian Husky out for a run on the swampy trail. A short drive away took us to the Equinox Marathon trailhead near the university's large animal research center. Musk oxen were lounging on the far side of a double row of fencing keeping them in and curious humans out. As we stamped in at the letterbox, the same student and Husky ran past us. Yet another box took us onto the Les Viereck Trail in the UAF system. Obviously there were connections between the various campus trails, but we lacked the knowledge (or a map) to hike from one to the other, so we drove to the next trailhead. At the site of the letterbox, someone—the planter or a finder—had taken the presence of paper birch bark seriously and drawn a couple of hints that the box was nearby. As we walked back to the parking lot, we encountered, of course, the familiar running pair. By this point, we would have been disappointed had we not seen them. Completed in 2006, the museum's expansion conveys a sense of Alaska's alpine ridges and glaciers. Before leaving the campus, we had to stop at UAF's Museum of the North, the only research and teaching museum in the state. 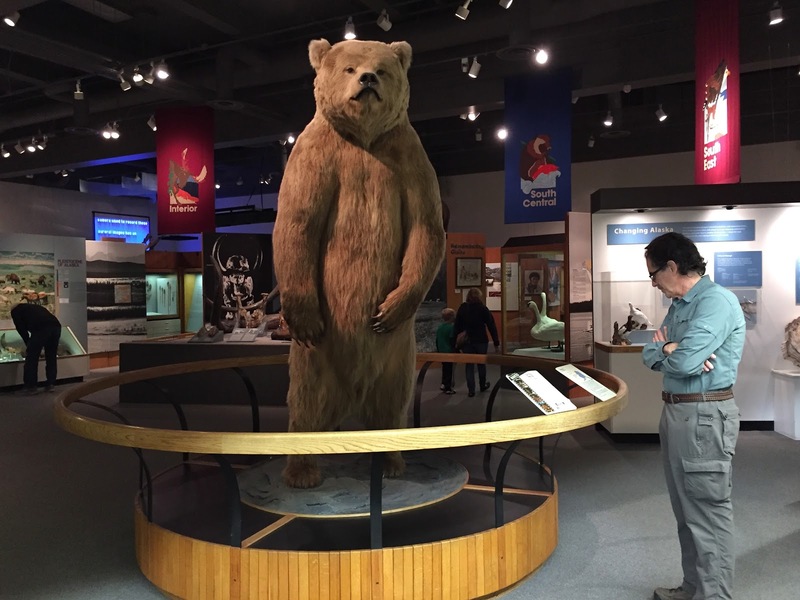 With an extensive collection of artifacts, the museum exhibits tell the story of thousands of years of natural history and cultural traditions in the North. The unrivaled star of the collection is a mounted grizzly bear who stands at the entrance to the exhibit hall and poses with almost everyone who enters. Nicknamed Otto by the staff, the bear stands almost nine feet tall and weighs more than 1,250 pounds. He is said to be the most photographed object in Fairbanks, and he patiently posed indefinitely for anyone who approached. Otto has become the mascot of the museum. Otto suggested we may want to drive out the Parks Highway west of town for a couple more letterboxes, and who were we to ignore a recommendation from a Fairbanks icon? We took his sage advice, and with that done, we headed to Creamer's Field Migratory Waterfowl Refuge, a 2,000-acre former dairy farm, with a network of nature trails. There we found several boxes and planted one with a stamp from our friend Karen. 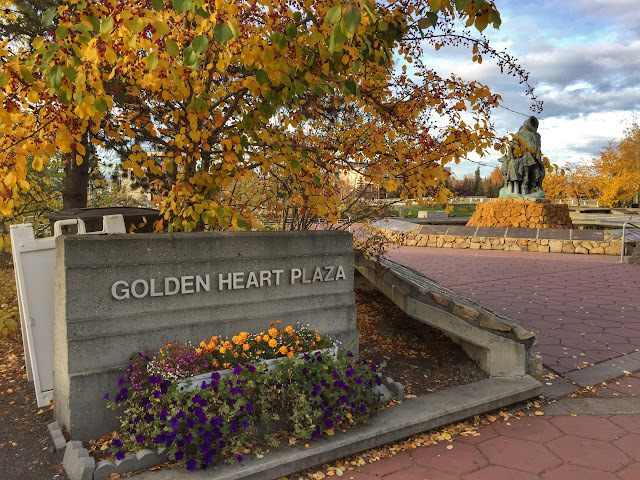 Since we would be leaving Fairbanks the next day, we returned to Golden Heart Plaza on the banks of the Chena River in downtown. Built in 1984 on the occasion of of the silver anniversary of Alaska's statehood, the plaza has come to play a central role in Fairbanks activities. Locals and tourists crowd into the park for summer markets, music festivals and the finish line for the Yukon Quest race. 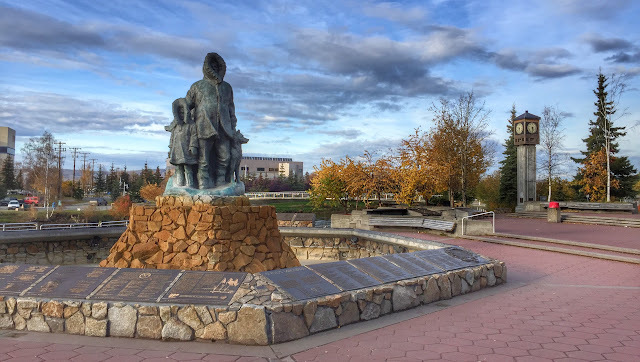 In the center of the plaza, surrounded by a fountain, Malcom Alexander's Unknown First Family, a sculpture of a Native Alaskan family, is said to represent "the family of all mankind." We considered leaving a letterbox in this scenic spot in the heart of Fairbanks, but like other urban parks, this one is the domain of the city's homeless. They have a great need for small places to hide things, so we decided against taking one for a letterbox. Unknown First Family. Clock tower placed by Rotary to commemorate their 50th anniversary in Fairbanks. Sunday, 9/25: As we should know from experience, the travel experiences others rave about often fall short of one's expectations. And we do know that, but somehow the knowledge didn't stop us from booking a 12-hour train ride from Fairbanks to Anchorage. Yes, we could have driven our rental car back to Anchorage where we picked it up last week, for a lot less money, a bunch more freedom, and a ton less time. We snagged a rare table row halfway to Anchorage, escaping the cramped front-facing rows. But, nooooo. We listened to all the hoopla about riding the train in Alaska and let ourselves get sucked in like a giant vacuum cleaner. Our experience was quite different from everything we had heard. The well-hyped panorama dome cars which promise spectacular 360° views had quit running the week before because they were designed with plumbing on the outside of the car making them unusable in an Alaskan winter. 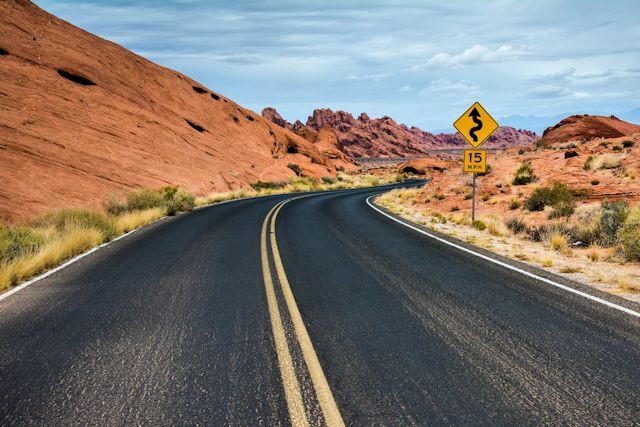 But even that wouldn't have made a difference because the scenery would have been just the same as it was in the 1980s-era bare bones cars we were in. 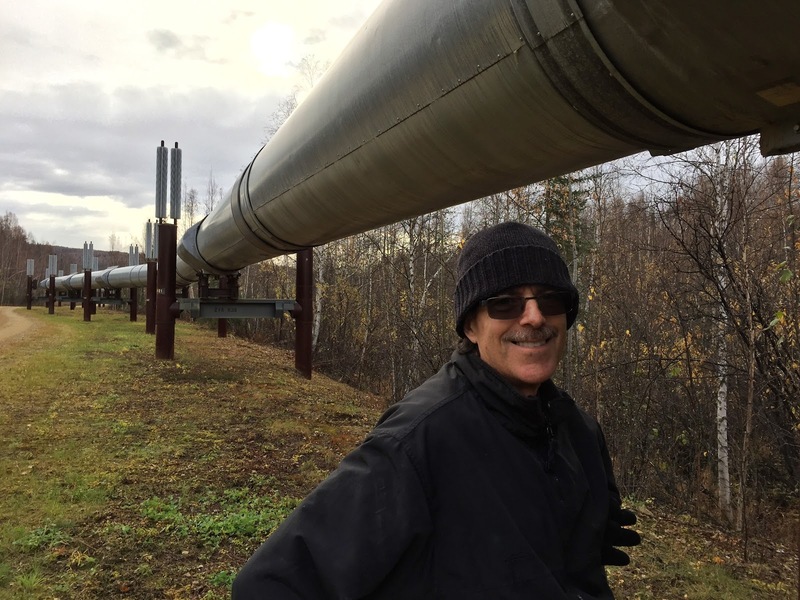 For us, riding the train from Fairbanks to Anchorage was a major waste of both time and money, a very poor substitute for what we could have seen and done had we driven the car. Taking a pic from an outdoor platform required battling the few who monopolized the spots. Live and learn? One would hope so, but we made the very same time-sucking mistake exactly two years ago to the date in New Zealand. At least that train had newer cars with comfortable seats and great amenities like wifi and electrical outlets. We've already marked our calendars for September 25, 2018—NO TRAIN TRAVEL! 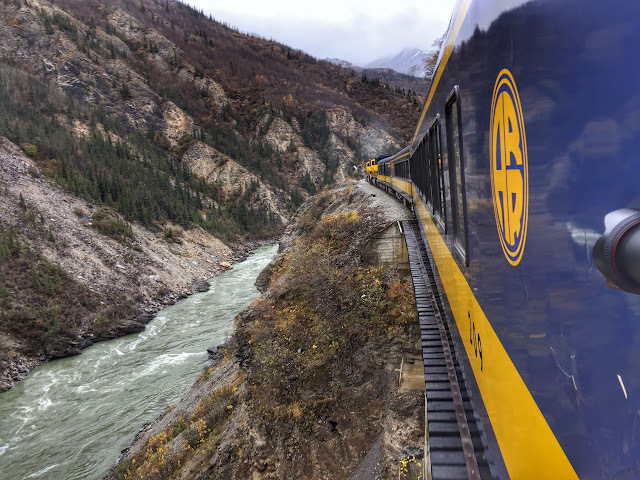 By the time we arrived in Anchorage on this very, very slow train, we had spent 13 hours to travel 350 miles—more than twice the time and a tiny fraction of the enjoyment of a drive down the Parks Highway. Tomorrow evening we'll fly from Anchorage to Barrow for an overnight visit to the northernmost town in the U.S. 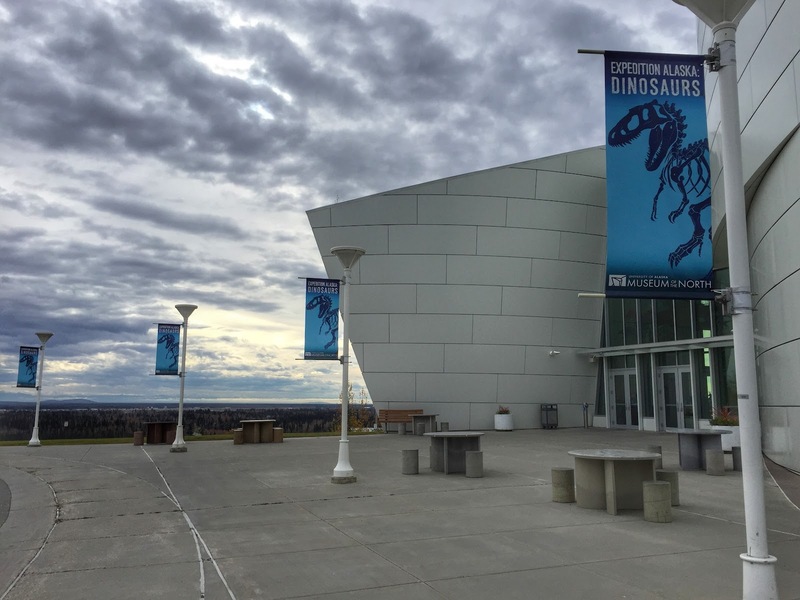 The museum's hands-on exhibits were popular with both kids and adults. At Golden Heart Plaza, the Yukon Quest start/finish line. Fairbanks' beautiful airport terminal where we returned our rental car. Refurbished aircraft "flying" above baggage claim in Fairbanks airport.